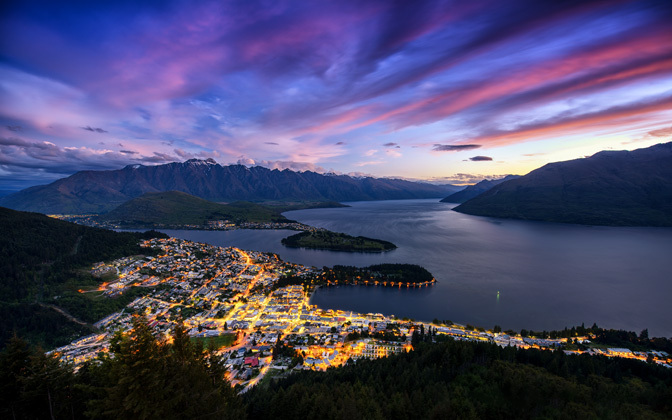 Ben Lomond (Bob's Peak) is a mountain in New Zealand which offers a great aerial scenic view over Queenstown, a resort town at Lake Wakatipu. A Skyline Gondola ascends Bob's Peak on Ben Lomond, making it easy to lift your 20 pound camera gear up to the 1,631m summit. Adobe Lightroom and Adobe Photoshop CC. Photo Settings: 14mm, f/4, 1.6 seconds, ISO 50. Send a Private Message to the Artist of "Queenstown From Bob's Peak"